I often have to write down small notes that act as reminders or information. Back in the days I used a combination of notepad documents and handwritten notes for that purpose. Today, I'd like to share a better option to take notes in the Windows operating system. IQ-Notes, is a free feature rich application for Windows to manage the note taking process. It is that feature rich that it may look as overkill to some users. The program places an icon in the system tray upon startup that controls the note taking. A double-click on the icon creates a new note, a right-click displays the context menu with additional options. New notes are taken in a simple text editor that offers plain text editing and some additional features such as bullet lists. IQ-Notes supports only textual information, it is not possible to add images or files to the program. Each note can be customized with a title and background color. In addition to that, it is possible to define additional options in the Note Properties. 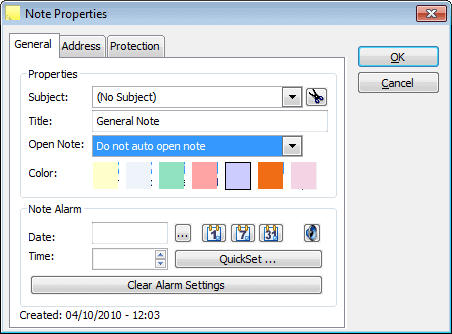 Here it is possible to configure a note alarm, that will display the note to the user at the scheduled time, add password protection to prevent unauthorized access to the note and configure when and how the note should be opened in general (for instance at system startup or when all notes are opened. Notes are not pinned to the desktop or always on top by default. They can be set to be always on top in the note taking window. Another interesting option is to attach notes to specific programs on the computer. Attached notes are opened automatically when either the program is started and iQ-Notes open, or the program is running and iQ-Notes is started. There is however no option to bring notes to the front if the application it was attached to was minimized and is brought to the front at a later time. 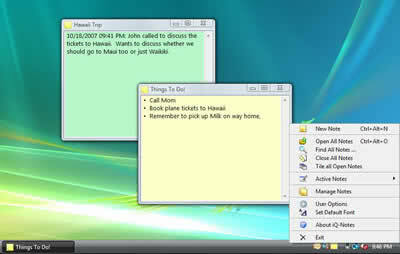 The sticky notes program supports several hotkeys, that allow the user to create, open, find and hide / unhide notes easily. The features do not end here, as iQ-Notes offers extensive backup, synchronization and export options. The application creates automatic backups of notes, which can be restored at anytime. The data directory for those internal backups is configurable in the User Options. Manual backups and restores can be started from those options as well. In terms of synchronization, it offers options to synchronize the notes with a ftp server. That makes it possible to use the same set of notes on multiple Windows computer systems. Notes are not stored in a text or ini file that are easy to read or hack from other people touching your computer. You can also protect certain notes with a password. As you see, there is more to explore that I have not mentioned yet. The program supports sending notes over a network to another user, a clipboard manager to easily add clipboard contents to notes and expense and time tracking functionality for individual notes. IQ-Notes is compatible with both 32-bit and 64-bit editions of the Windows operating system. Interested users can download the application from the developer's website at paresi.net.